It’s been more than two decades since Dyson rose to fame with their then-innovative bagless vacuum cleaners. In the meantime, the U.K. company has been launching everything from heaters to hand-dryers and air multipliers and washing machines. Aiming to help the population of China breathe fresher air, Dyson launched last year its first ever air purifier. The device was marketed only in China at first, as some studies say that more than one million people die prematurely due to nation’s toxic air. Today, Dyson announced a new version of its air purifier, but this time, it’s targeted at the U.S. and other markets around the world. Priced at $500, the Dyson Pure Cool Link is a lot like its first generation, except it can now connect to your smartphone for remote control. The accompanying app also allows you to see stats about the nasty pollutants plaguing in your home. While the purifier can be manually controlled, users can also enable an automatic mode that activates when the air quality reaches a predetermined level. The purifier consists of a 360-degree glass high-efficiency particulate arrestance (HEPA) filter and is meant to control the airflow. Its number one priority is to maintain a preset target air quality, but Pure Cool Link can also double as a fan to help you stay cool during the summer months. Dyson offers the second gen air purifier in two versions; the “tower” can maintain air quality in larger rooms and can be placed on the floor while the “desk” version is significantly smaller and is meant to sit on your desk or table. Thanks to its filtration systems, the Pure Cool Link “automatically removes 99.97% of allergens and pollutants as small as 0.3 microns” from the air you breathe while you’re in your home. The purifier fan is Dyson’s second “connected” product, representing the company’s new foray into the “Internet of Things (IoT)” craze. Dyson’s products add to an already long list of connected products already launched in 2016, such as smart doorbells, beds, ovens, and fridges. 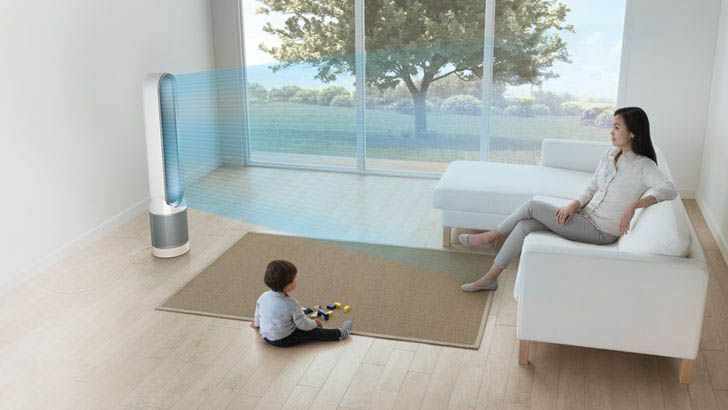 While there are other air purifiers on the market, Dyson holds the advantage of offering one that connects to the Internet, appealing to an increasing market of users wary of pollution hazards. Founder James Dyson explained that it’s not just the great outdoors that is plagued with harmful air. Living in proximity to heavy traffic or a power plant can increase the domestic pollution, but studies showed that scented deodorants, cleaning solvents, and mold can also contribute.